New Forever Freebie! Well, actually an update of an older forever freebie housed on my blog. 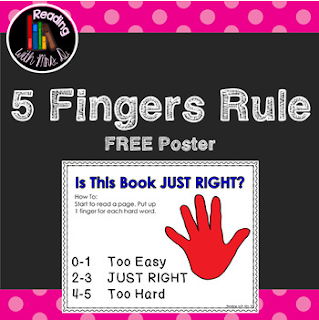 Just Use this poster as a visual reminder for your students in your reading center of how to tell if the book they have chosen is a Just Right fit for them. Make sure you review first to open to the middle of the book and start reading. Put a finger up each time you get to a word you don't know.